Click on the pictures to see more or to enlarge. We arrived at MARTY’S PLACE and discovered the wonderful photos online told only half the story. This is a terrific house, warm and inviting, with great views and grounds. The flow of the main floor welcomes a large family together as a big group or gathered in smaller conversation areas. The kitchen is well appointed and the layout works for more than one cook! As we were there in early Spring we were thankful for the large covered porch and fire pit. The location is perfect; walking distance to Langley and only a short drive to many of Whidbeys other attractions. 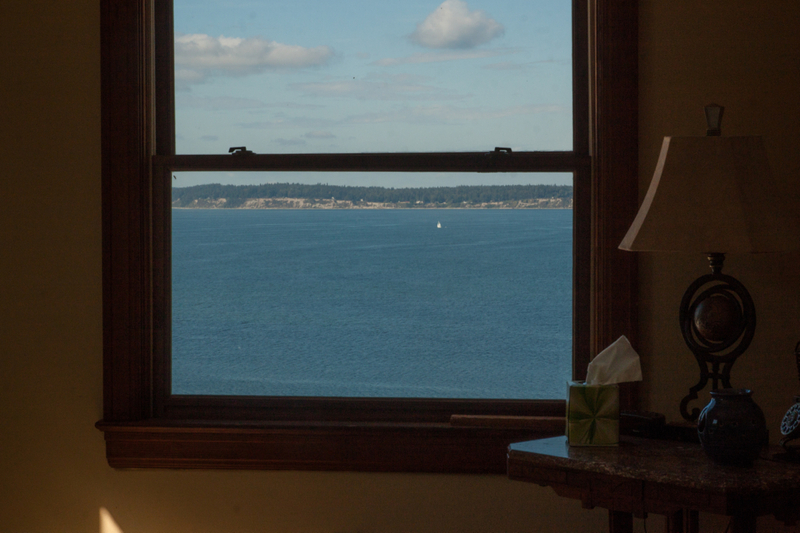 This was our 3rd January retreat at the delightful Marty’s Place in Langley, WA on beautiful Whidbey Island. This vacation rental is hard to beat! Plenty of room for the 10 of us to sleep, eat, play games, and visit by the fire. Since several in our group are great cooks, we really enjoy the well equipped gourmet kitchen. Langley is close enough to walk to and offers good restaurants, coffee and shopping. We are looking forward to January 2018! This vacation rental is hard to beat! This is the third time we have stayed with friends at Marty’s Place. 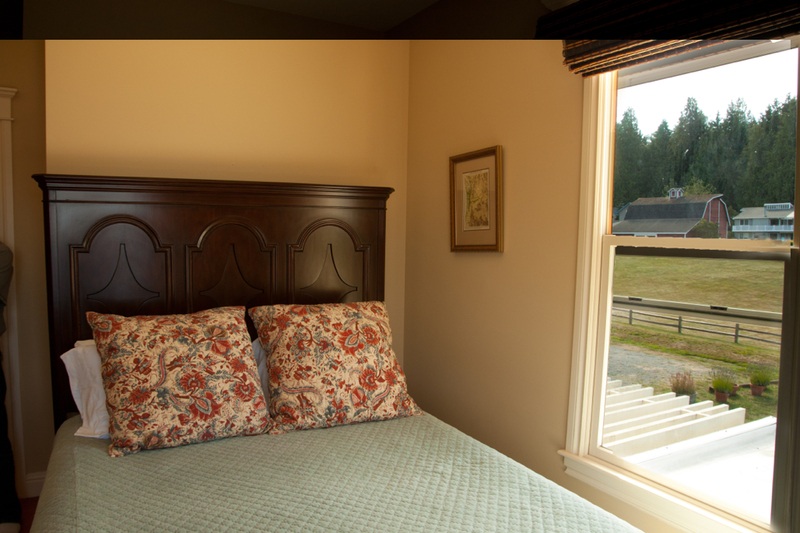 The building is a beautifully restored farmhouse with acres of yard and a view of Saratoga Passage and Camano Island. 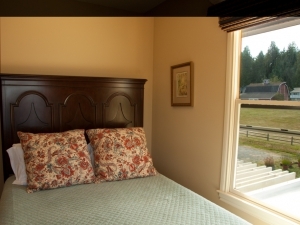 The accommodations are comfortable, spacious, and very well maintained. The kitchen is well equipped (although the knives are incredibly dull!) and we had no problems cooking and baking during our stay. The walk to town (Langley) is not too long and there are good restaurants and shops there to keep you amused when you;re not relaxing at Marty’s Place. As in the past, we left looking forward to our next visit. We just returned from our favorite get-away spot. Once again, we are so appreciative of the care lavished on this beautiful old home. It is clean, comfy and beautifully situated. As you may know, the weather was an added bonus. As were the doe and her two fawns who visited. We just stayed at this gorgeous home for a week, and can’t wait to return. We had family coming in from Pennsylvania and Colorado, and felt this would be a lovely place for our group to gather, and we were not disappointed. With 6 adults and two small children, this was the perfect base for us to explore Whidbey Island and the surrounding area. This home is spacious, perfectly equipped, beautiful and extremely well maintained. With the gourmet kitchen and large dining area, we planned evening meals each night in the house. The wrap around covered porch is the perfect location for afternoon happy hour, bird and whale watching, and just relaxing. We also took advantage of the wonderful fire pit, roasting hot dogs and eating S’mores! Langely is within walking distance and has quaint shops and restaurants to enjoy. I can’t say enough about this fabulous home. It oozes pride of ownership! Our family made special memories here that will never be forgotten! We had our second stay at Marty’s place with our extended family, children, grandchildren and grandparents. The house works so well with a group. Large kitchen with two dishwashers, dining room table to seat 14, several seating areas separate from the TV room , sweet little play area upstairs for children plus the beautiful porch to enjoy the view. The house is clean and well looked after, and one small problem we had on our stay was correctly very quickly. The owners have been very quick to respond via email both when booking and during the stay. There is so much to do at the house, from outside play in the huge grounds, to loads of boardgames to play inside. About a 15 minute walk from Langley which has lots of great restaurants, coffee shops, stores and wine shops. A very pretty little town. We love Whidbey Island and Marty’s Place is a perfect place to stay for a visit. Just a fabulous house for a group! 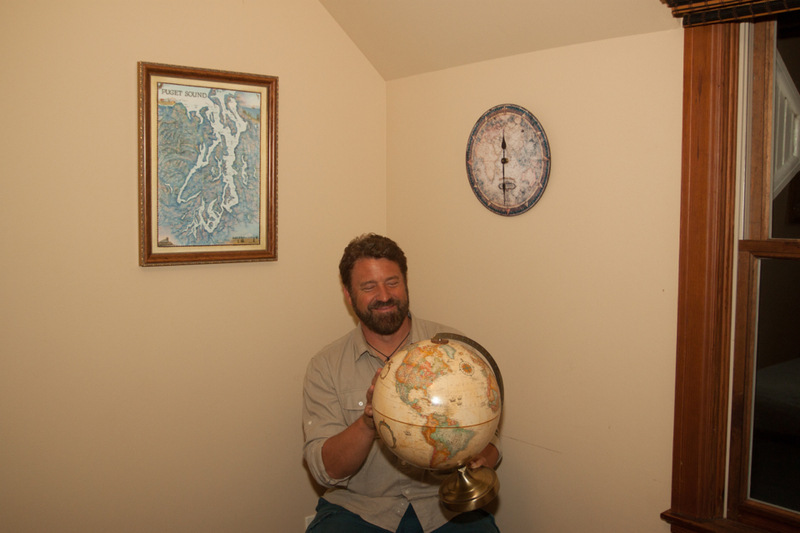 We had an Awesome time at your beautiful Whidbey home. Loved the kitchen, loved the beds, the view… Everything about it! Wonderful time and can’t wait to visit again. Weather was perfect and Whidbey is beautiful! We thank you so much again for your compassion and generosity. This was the perfect place for our family reunion. Walking distance to town if you’ve got teenagers with no car who need to get away from the adults, and also plenty of separate nooks for different groups to have their own socializing space. Fire pit for those clear summer nights. Bunnyopolis in the blackberry bushes, and deer on the lawn. Sunsets on Saratoga Passage. The kitchen was a dream; I didn’t even want to leave that kitchen to go kayaking and still fantasize about renting the house for Thanksgiving one day. Absolutely amazing. Chill like an otter: Two-thirds of a mile from the town of Langley, the sprawling waterfront Marty’s Place property is the ultimate family spot (4667 Strawbridge Lane; 877.814.0503; martysplace.com). With five bedrooms, a few cozy lounging areas, a modern (and fully equipped!) kitchen and an outdoor fire pit at the top of the bluff overlooking Saratoga Passage, the big yellow manse is the perfect launching pad for exploring the island. Outside, there are ample tromping grounds for little people—if you’re lucky, you’ll book during blackberry season, when the bushes along the vast lawn ripen—and a long, covered porch from which grown-ups can holler without spilling their rosé. Lovely place with lots of usable common space. Excellent for large family reunions. Super bonus: the many fruit trees with tasty fruit! We had a great time. Our group of old friends has traveled widely together through the years, and were fortunate to spend a few nights at Marty’s place. 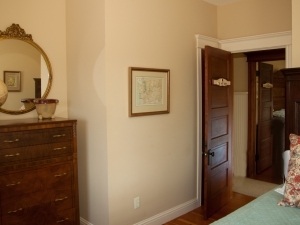 It is a comfortable, welcoming home which is very well appointed. Lots of space for the 8 of us, great kitchen, comfy beds, very relaxing and quiet. Charlie was quite helpful and answered questions promptly. Langley is a charming village, with a few good restaurants if you decide not to cook at the house. We will return! We loved every moment of our stay. I wanted to tell you how much my family and I enjoyed staying at Marty’s Place for our son’s wedding the weekend of Sept. 23-25. The house was amazing and so comfortable for all of us; we had plenty of room for everyone (the kids in the family were totally enchanted by all the toys!) And having the firepit to enjoy after a long day was so relaxing. Again, thanks for all your help and for sharing such a beautiful place with us. This September my group of 50 something year old women will be embarking on the 25th anniversary of travelling together. And where are we celebrating? At Marty’s Place, of course! 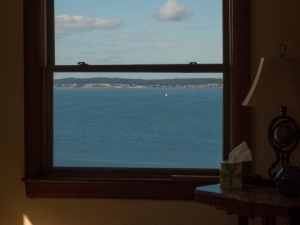 Actually, this will be our 4th year staying in this beautifully restored old home on Whidbey Island. A gourmet’s dream kitchen, plenty of room for the six of us to put together a fantastic meal or two. Views everywhere you turn, wonderfully kept grounds, fantastic covered wrap around deck, comfortable beds and lots of bathrooms! And if that weren’t enough, a very helpful and responsive owner/caretaker should any problems arise. I can’t recommend this home enough. But don’t make your reservations for early September…that’s when we go!! Marty’s place was absolutely perfect! It was a great place to connect with family and friends while spending time together. My husband and I got married on whidbey and rented Marty’s place for the bridal party since everyone was coming from out of town. I couldn’t think of a more perfect place to spend time with loved ones. The fire pit was our favorite part of the property! The place was expansive, had great views and very comfortable. The kids had a blast running around in the front and back lawns, playing with the toys in the house and enjoyed learning the piano. 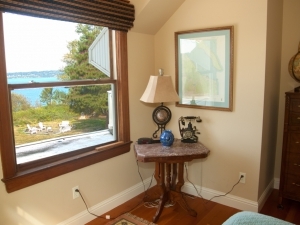 The master bedroom had a patio that opened up to the ocean view. 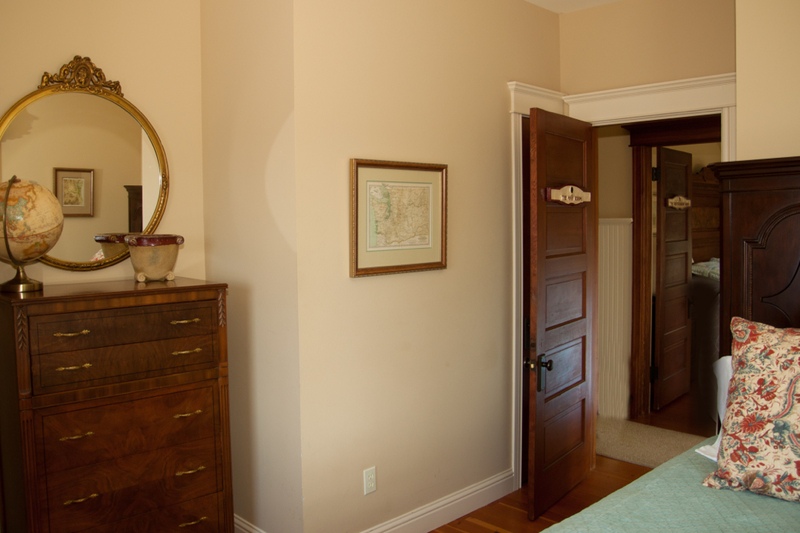 The house is older and we noticed a couple of things – the property manager was very responsive to our calls. Overall, we enjoyed the place and would definitely come back here next year. I want to tell you how much we appreciated being at Marty’s Place. It accommodated our family reunion of four couples perfectly. We enjoyed ourselves and took advantage of the many homelike amenities you have invested in the place. Thanks for provided us with a most suitable place for our families being together. I just wanted to tell you how much we enjoyed our stay at Marty’s place. My jaw dropped when we walked into the house! So beautiful. Thanks for sharing your home. My jaw dropped when we walked into the house! We have had the pleasure of staying at Marty’s Place three times, each time in May. Their garden and all the gardens on Whidbey Island are in beautiful Spring bloom in May. We LOVE the house and it really does sleep 12. We have also enjoyed the house just as a couple, very romantic. It is a lovely, old house and it has always been sparkling clean. The Owners have always been very responsive to questions. 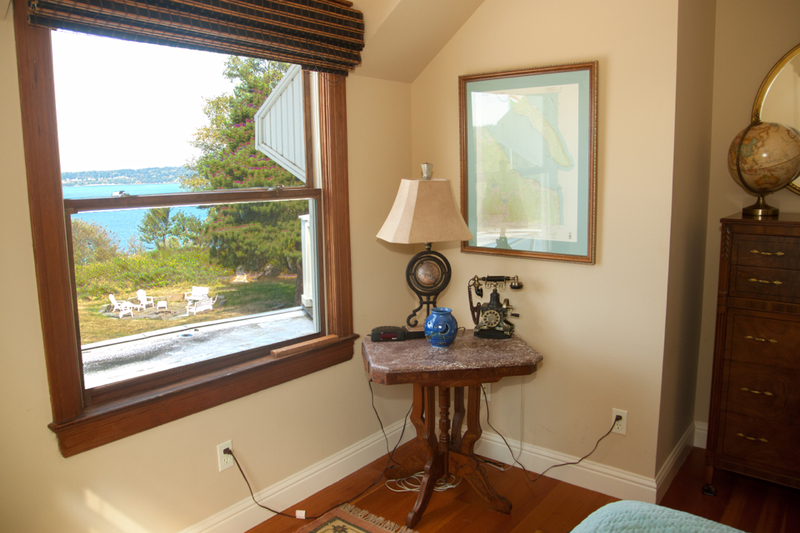 The Master bath and suite is to die for, as are the many water view windowseats around the house. Perfect for families or three families. The Island is fun and it really is just an easy mile walk to the charming village of Langley. Two choices for golf on the island and several wonderful restaurants. We fell in love and can’t wait to return. We were a group of 11 adults on a retreat weekend and had an amazing stay at Marty’s Place. 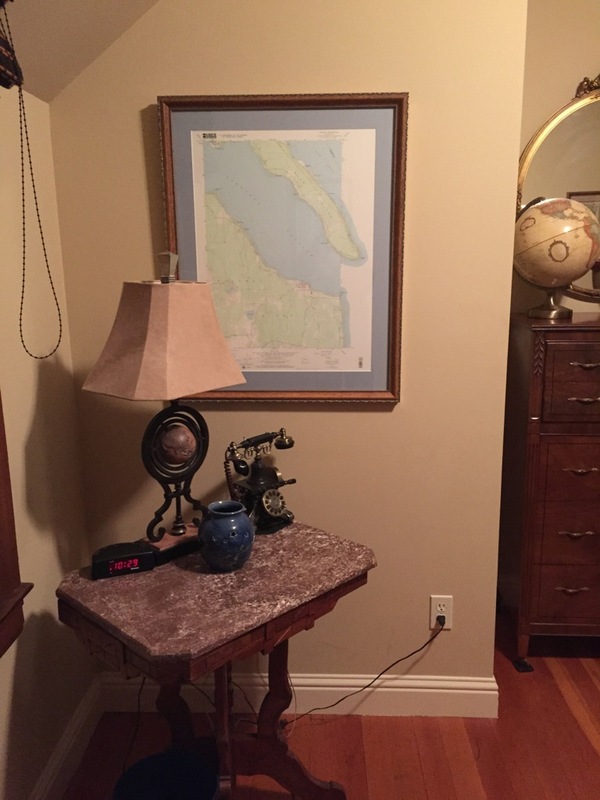 The home is in great shape, very spacious with lots of fun rooms and nooks to relax in. The kitchen is such a fun place to cook, we cooked large meals for the group and clean-up was easy with 2 dishwashers and 2 large sinks. There is a large gas range! Outside the home, it was a cold weekend when we visited, but there is a beautiful wrap around porch with chairs and a fire pit. The view is unbeatable! Langley is a short walk away, which we did many times throughout out weekend. Fun for local coffee, art and shopping. Highly recommend this home! Charlie was great to communicate and plan with! 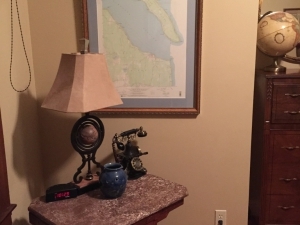 This is a five star review on HomeAway! Some photos Copyright © 2014 by RA Stine. Some photos © 2010 by Heston Photo – http://www.HestonPhoto.com. Click on individual photos for details.